How do I get a .mobi ebook onto my Kindle? - Ask Leo! How do I get a .mobi ebook onto my Kindle? ".mobi" format is the native format for books used on Amazon Kindle reading devices. I'll show you how to get that ".mobi" book you just downloaded from your PC to your Kindle. Leo, I bought one of your books and I see that I can download the book in .mobi format from you. You say that’s the Kindle native format, which is great since I have both a Kindle reader and a Kindle reading application on my smartphone. Only one question: after I download it how do I get the book from my computer to my Kindle? Turns out there are at least two different ways to get that book onto your Kindle. And then of course you can also read the book without a Kindle device at all. Not everyone realizes it, but every Kindle activated with an Amazon account is assigned a unique email address. You can simply email the “.mobi” file as an attachment to the email address associated with your Kindle. As you can see, I’ve clicked on one of my Kindles (we have several), and beneath it the page lists the email address associated with that Kindle. It’ll be of the form [something] @ kindle.com, where “[something]” is probably a combination of name and numbers. Save that email address. I actually have it in my address book as “Leo’s Kindle Fire” so I can quickly compose a message to it. There’s one more step: authorizing the sender. 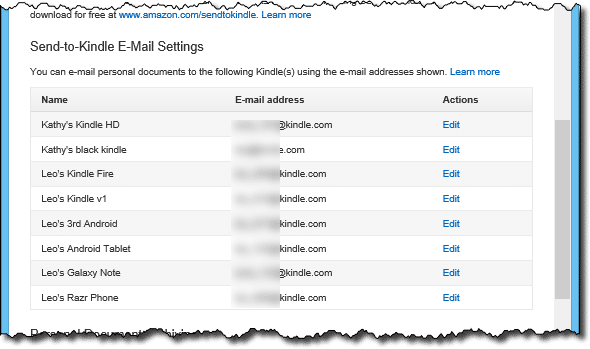 This gives you another overview list of all the email addresses associated with all of your Kindle devices and mobile applications (I told you we had several  ), but without the device picture for easy identification. The email message Subject and Body are optional, and completely ignored. All that matters is the “.mobi” file attached. Note that either or both of these can take a little time before they appear, and before they appear across all your devices. And of course your Kindle must be online in order to receive the download. The other approach is relatively simple, but in my experience a tad less reliable. In Windows Explorer / File Explorer your Kindle will either appear as an additional drive, or as a Kindle device. In either case copy the “.mobi” file into the folder “Books” (Kindle Fire devices) or “Documents” (Kindle Paperwhite and older devices) in the device’s internal storage. Note: in my experience the various lists of books provided by the Kindle device can sometimes take a while to update. Also note that copying a book to the device in this manner does not place it in your Kindle library for other devices. I personally find the email approach above to be much more reliable. For completeness you can, of course, read the “.mobi” book on your computer or laptop without needing a Kindle at all. Download and install the Kindle Reader application for your computer, laptop, tablet or any number of other devices. On your PC, for example, you can then just double-click the “.mobi” file in File Explorer to open it in that application and begin reading. As a side-effect, you can also login to your Amazon account using that application and have access to your entire Kindle library as well. This is what I use on my Android-based smartphone, and as a result I have an entire library in my pocket wherever I go. What Is DRM? - DRM is digital copyright protection. Unfortunately, it's both imperfect and annoying. How Do I Remove an Invalid Email Address from Auto-fill? - This is all about the many ways your computer tries to make your life easier. Sometimes it tries just a little too hard. The solution is fairly simple, but may be in one of several places. « Previous post: How Do I Download and Read a PDF eBook? The way I transfer mobi books to my Kindle HD. Is to plug my kindle into the USB slot on my computer. Turn the Kindle on. Go into Explorer on my computer, go down to Computer. You will see C:, D:, (other drives if you have them), then Kindle. Click on the + sign on the left side, then click on the + sign to upen Internal Storage. You will see a list of folders on the Kindle Tablet. I move the mobi book into the folder named Books. Then read the books on your Kindle Tablet. Leo mentions that in the article. Sometimes there are small configuration changes that need to be done to a file. With the email method Amazon does a conversion on the file. LIke leo says it’s a bit more reliable. I notice that when I email a MOBI file to the kindle is putting the file in document folder. If I copy the mobi file to the book folder when I connect my kindle my computer it does not display under books in the kindle. If you have a Kindle, chances are you have the ‘SendTo Kindle’ as part of right click on your mouse (Windows). When selected it will bring up a list of Kindle devices including apps. Select which Kindle device(s) to send the book to off it goes. You can send to as many as you like. This function may have been part of the app install – not sure. 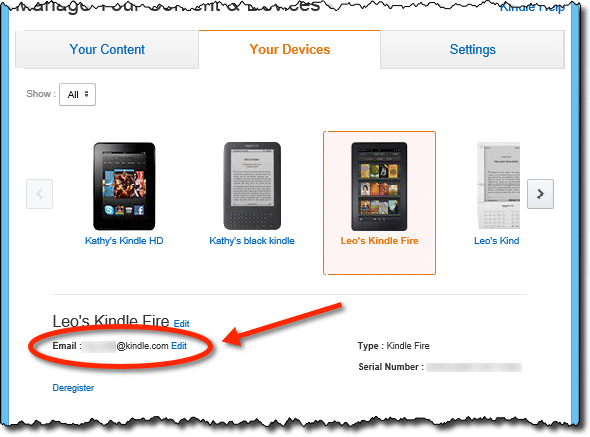 The only catch with this method is you need to know the Kindle device name rather than the email address. You can also read mobis through the Kindle Cloud reader. This is basically a web browser app. I use it on Chrome since I can’t load the Kindle app on my PC at work. After you sign in, your library is available. Pretty cool. Since I’m feeling verbose… a great tool to use for converting files for your Kindle is Calibre (http://calibre-ebook.com/). It’s available for almost any OS. You can use this to do about anything to almost any ebook format. I have thousands of old PocketPC ebooks (.lit) that I convert every once in a while to the Kindle format. You can even set up an ebook server, send stuff directly to your device, and find install plug-ins available form other people. It also acts as an ebook library (sort of). Pretty great piece of software. Agreed. I’ve used it for a long time. It tends to be a tad complex and non-intuitive for people that just want to read a book, but it’s exceptionally powerful. Unfortunately I don’t have a Nook myself. I know that Nook uses “.epub” format (which is why I make my books available in that format). But I would assume that somewhere in the Nook documentation are instructions for transferring such a book to the device directly. 3. Double click NOOK drive and drag files from PC to “My Files” folder in NOOK. 4. Right-click the NOOK drive and click “eject” before disconnecting cable (or use the “Safely remove hardware” icon in the system tray). 5. Added ebook should appear in your NOOK library. Note: NOOK takes .epub format only. Excellent help! Worked perfect using the amazon/email mobi attachment thank you!!!!! I’m not using a Kindle but an Android tablet. I emailed the .mobi to the tablet and downloaded the Kindle Reader application. Then, I tried to open the .mobi with the Kindle Reader but it does not located within the tablet. I also tried to double click on the .mobi to open it that way; but the tablet indicates that there’s no app to read it with. So, what’s happening? Why will my .mobi, which opens fine on a Kindle, not open when using the Kindle Reader app on a non-Kindle tablet? Do you know? You may need to mail it to your @kindle address to add it to your Kindle collection. I had a similar problem. I installed the Moon Reader App and was able to open those .mobi files. If I had known Leo’s solution at the time, I would have tried that, but I kinda like the Moon Reader now. Thank you for the Android tablet advice. After two wasted hours I can finally start my book! I’ve used this method for ages and it’s always worked without a problem, but I’ve just signed my mum up to Amazon so that I can send her eBooks to her iPad, and non of the books I send will sync to her iPad. It gets half way or sometimes almost to the end, but then hangs and ultimately fails. Do you know if Amazon have introduced some kind of security on newer iPads? Not that I’m aware of. It’s very UNlikely that Amazon is trying to intentionally prevent this. Why do my emailed books go to Documents instead of Books? This is unclear, and seems to vary based on which kindle device you have. I know of no way to change it. This should help you out completely. Enjoy! I have downloaded the .mobi file to my pc, but now I can’t seem to find it to attach to the email to send to my Kindle. Am I just dumb? I copied the location of the download, and tried finding it in various places in the pc but no go. Any advice? Download it again, check your downloads folder, do a search for *.mobi … those are the ideas that come to mind. Never mind. I finally found it, and was able to drag it into my email and it has shown up on my Kindle home page. Thanks for your insrtuctions. Awesome! Thanks! The .mobi file sent to me by an author is now on my Kindle Fire and on my Kindle for PC. I must be doing something wrong I open the email on my Kindle fire and It gets downloaded but to my docs. Any way to move to my content and open in books instead of being in doc’s? On my Fire the files I send show up in Docs as well. Hi there, I’m coming to this discussion very late but it’s exactly what I’m having problems with. I’ve followed your instructions I believe and downloaded the .mobi file from the authorised email address and it start to download and when it says “tap to open” a window pops up and says “cannot open file” no idea what to do…any ideas would be grateful. A little frustrating to say the least!! Thank you ! How I can get my Mobipocket books (prc files) into my android note 10.1 2014 Kindle app? I’m actually not sure, but I would assume the process to be similar: mail or copy over via your USB cable. Many of those Mobipocket books (prc files) are secured MOBI files, I have a ton of them and haven’t found a way to convert them to get them into my Kindle yet. I can’t get around the digital rights management in the files. I still have to have the Mobipocket app on my laptop to read any of those books. If I don’t find a way to deal with them, I may have to just find a way to get them again. Though I’m loathe to buy them again. I have a significant amount of money in those books. several series and other books. Did you try emailing them to your account as Leo suggests? Hi Leo, good article. Problem for Gmail users is the 25mb maximum attachment size limitation. Google suggests using Google Drive to embed file in email but amazon doesn’t recognize file as an attachment so no dice. Just wondering if you’re a gmail user or know an easy way round this? Cheers……………..Bruce. You aren’t going to be able to get past an attachment limit on your email. So your choices are to use a different email, or use the USB connection option that Leo talks about at the bottom of the article. As mentioned in the article and this happens frequently with my kindle – using the USB connection option, Amazon can screw up the formatting of the book and is no where near as good as the email one. Don’t want to ditch Gmail either and use another email provider…………………………… Thought someone might have had a clever wrinkle to get around it, apparently not, sigh. Thanks Leo but no real solution for me, see my above answer to Connie. just about every non-Amazon purchased e book I’d want to transfer is over 25mb and heavy on complicated graphic and font content (Lonely Planet’s etc). It’s a pity Amazon is such a PITA about their proprietary systems, they could make it a lot easier to introduce non-Amazon books into their eco-system. Guess I’ll just keep reading non-Amazon ebooks on my other non-kindle readers ……………….. Cheers, Bruce. 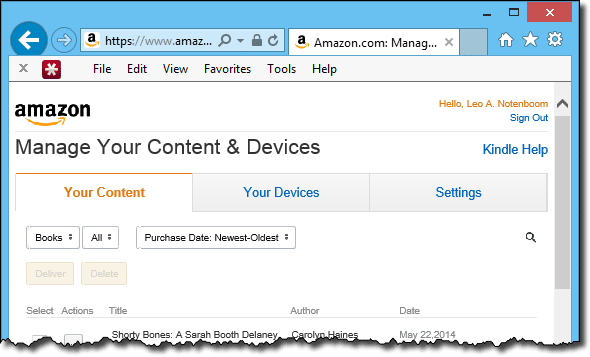 For the record, Amazon doesn’t munge the .mobi format – so regardless of how you get it there – USB or email – the problems you’re experiencing would be the same. Well all I can say is that if I download a Lonely Planet ebook from Amazon’s site it works spot on my kindle. If I download another Lonely Planet ebook from Lonely Planet’s site to my PC then copy it to my android readers and my kindle device, it is perfect on the PC and android readers but the Kindle has display issues with some of the maps, some dynamic links don’t work and some font styles get screwed up. It is still usable but very frustrating at times. This has happened more than once and the problem has only manifested itself with the kindle……. Don’t want to sound like a conspiracy theorist but remain to be given a rational explanation :-)………… Thanks anyway for your time Leo, cheers. I copy .mobi files to my Kindle by USB cable. The PC says they have copied but Kindle does not recognize them. This method worked for the first 200 odd books. A very informative article regarding mobi files, kindles and ereaders. Brilliant! I came here just to re-check I was doing it right! I am !! Many thanks. Wasn’t sure about multiple attachments – good to know. Thanks back! I send file to my kindle email, the email is sent, but does not download to kindle, nothing happen on kindle. I always download file via computer. i want to get book via email. can you help me please? why email does not work? Triple check that a) you are sending to the correct email address, b) triple check that you are sending from the correct email address (you must pre-authorize the email address that Amazon will accept your Kindle attachments from – the “Approved Personal Document E-mail List” in the article above) and c) triple check that any bounce messages aren’t ending up in your spam folder. Thank you so much! I found several different forums but this is the only advice that worked!!!! Thanks for the detailed step-by-step instructions. The process you advise worked perfectly in getting my .mobi file successfully in my Kindle account. In fact, I’m using the Kindle for iPhone app and it worked smoothly for this too. Unfortunately, the formatting on the eBook is not accurate (doesn’t match the native PDF). However, I believe that’s likely an issue in my file conversion process, NOT the process you outline here. I used PDF4Kindle for the file conversion, by the way. I welcome any input you have about that too. I’m about to try Calibre to see if that resolves the formatting issues. Thanks! I emailed a mobi file to my Kindle Paperwhite & it loaded but now it says Wi-Fi required. I don’t have Wi-Fi & have never needed it before. Any ideas, suggestions? The Kindle needs to connect to the Amazon servers in order to get the email that you sent. You would need to connect the Kindle to the internet in order to retrieve it. It doesn’t have to be internet in your home. You could go to an internet cafe to get the file. The only way to get a file directly from your computer to your Kindle without internet is to connect it via a USB cord and transfer it directly that way. I’m using a Mac, and can drag files onto the Kindle in Finder, and see they’re on there, but then can’t find them when I use my Kindle. Emailing them works! I’m glad, but seems like a silly workaround to something that should be easier. Maybe amazon is trying to dissuade people from getting free books from Project Gutenberg, etc. You can also use this tool http://www.justsendtokindle.com/ It allows you to upload files (including personal documents) to kindle directly from internet. 1) Try to compress (ZIP) the .mobi file. This may get it under the file size limit and Amazon will automatically uncompress it at their end. 2) Use the ‘Send To Kindle’ app (available for PC or Mac) which lets you upload files directly. I’m not 100% sure but I think it’s limit is 50MB – certainly I’ve uploaded files up to 38MB with no issue. Thank you so much for this article!! I was totally baffled on how to read my new book in the mobi format. I’m so thankful you posted this article, now I can get back to reading and reviewing!!! You are a LIFESAVER! Can you tell me how I remove unwanted files that got accidentally sent to my kindle email address. Some have got onto my Kindle and I cannot delete them from it. My first reaction would be connect the Kindle to your PC with a USB cable, and then use File Explorer to locate and delete the files. The book does get processed by Amazon when it is uploaded, so going directly to the Kindle is likely to give a different result. You may want to try the step that Leo suggests, and email it to your Kindle instead. Then it will be processed by Amazon and usually gives a better result. I am so, so grateful for your explanation on how to transfer a mobi book to my Kindle Paperwhite using the Kindle E-mail address No matter what I tried I had been unable to move the downloaded book to my device. Your simple, clear directions helped me get things working properly! Thanks bunches! Hi Leo. Thanks for helping an old man understand simply how to download a MOBI file book to his Kindle. I followed your directions from the top and couldn’t believe how simple it was. Good man – you deserve a medal and thanks so much, Mike aged 77. Also note that copying a book to the device in this manner does not place it in your Kindle library for other devices. Is there a way to get them into the library ? Emailing it to your kindle email address will add it to your library. But won’t make it available for others. If it’s your own book, you can upload it to sell on Amazon’s developer site and then everyone, including yourself, can buy and download it. I think she meant other devices of her own. In my case I have multiple Kindles, Kindle apps and so on. It depends on the type of book and the kindle device(s) you own. In many cases the documents actually DO appear, but in the “Documents” section of the device, not the “Books”. Great advice on how to move a mobi file from my PC Kindle app to my Kindle Reader. Nobody seemed to know how to do it, and just copying the file from one to the other didn’t work, at least for me. I followed your “send it by email” instructions and all went well. So you made my day. Thanks a bunch. I followed your instructions to the T and it worked perfectly. Thanks! Leo, I have a number of books in Calibre on my PC. I would like to place them on my Android tablet, in the Kindle program. For some reason, I can’t transfer them while I have the tablet connected to the computer by a wire. Very upsetting. I had about 200 books on my tablet, but one of them wouldn’t open. When I called Amazon for guidance, they had me de-register my Kindle and then load the Kindle program onto the tablet. Then they had me sync up the tablet. Wiped out all the books that I had that were not purchased from Amazon. Uurgh! Does kf8 mobi support the audio content? Leo, I successfully downloaded my first book, using your method. Can you use the same method to send your an epub book to your Kindle program? No. Kindle doesn’t understand “epub” format. You’ll need different software. You can use a program like Calibre to convert it to Mobi format if it’s not DRM protected. That’s how I get books originally other formats on my Kindle. I wish I could easily copy a .mobi file to my Samsung Galaxy tablet. I can’t find the file folder to save it to. And I can’t email it using google because of the file size limitation. And Kindle does not have a way to simply upload it to my account. How frustrating. Use file explorer and move to the mobi file to the kindle directory in internal storage or the SD card. I’ve done it many times with noproblems . You then need to sync the books in the Amazon app. Use the More option to get there. I was unable to download a mobi file into my Kindle file either with a USB or using email, and Amazon support was hopeless. Turns out the solution was to not have spaces in the name of the mobi file. This_is_an_example.mobi of the way to do it. You’d think Amazon would tell us! It’s a bit off topic, but I also learned that Amazon will not replace the worn battery of a kindle fire. You have to do it yourself with 3rd party parts. Amazon doesn’t say that either! Leo – you are a star – I’ve been struggling to download a mobi file from the Outlook App on my Kindle Fire and it keeps telling me it has no app to read it. This is brilliant! Thanks. Maybe you can help me. Emailed the mobi to all of our devices, Kindles and apps for androids but I’d like to also read it on my computer. It says that Kindle is installed but when I double-click on the mobi file, I get the “open with” window and the kindle is not there. Any ideas please? “It says it’s installed”…. how? Did you install it yourself? What Windows version? I can not get books I’ve downloaded through email to go into kindle books app. They show up on the front of the device but one I touch them leave and go back they are gone and I have to start from the beginning of the book. Help! Many thanks; you’ve been helpful, as always. when I hook up to my computer by USB it opens on the camera files, from, how do I get back to the main menu? i have send .mobi file as an attachment to the email id registered in my Amazon account, yet the file doesn’t appear in kindle app. The Open in Kindle is no longer an option that I can see when I go to download a email file to Kindle. This just seems to have happen recently. You might need to reinstall the Kindle app on your PC. I have several (4) mobi books I want to email to my Kindle Fire. May i email all in 4 in one email or must I send 4 separate emails? Sorry but this doesn’t work. The email fails although everything is correct. Secondly, the file transfer/conversion does not work because it does not show up under the books tab. I have to use the stupid ESFile manager just to see it at all. Most of my Author groups use Instafreebie to send me their books. These come in moving form which have to be downloaded, then saved, then forwarded to ‘send.to.kindle ‘with Convert added as the subject, then they go off to docs where they are hard to find. No cover or info, and they could also end up in local storage in some kind of code.. impossible to figure out. But they never go to my library. BookFunnel is another service authors use. (Not enough). It’s wonderful. Download the app , book gets downloaded from it right to your kindle library. It shows up just like you order it from Amazon and don’t have to do anything else . I have kindle fire, and its not turning on? How to rest my kindle, can u suggest me. You’d have to bring it into a shop and have a technician look at it. For some years have moved .mobi files into my Kindle for PC by double clicking. After updating the Kindle seem to have lost the association, double click brings up dialog box asking for manual selection but the Kindle no longer appears in the list of programs. Have uninstalled and re-installed without affect so am presently unable to access my large library of .mobi titles. Is it possible this is caused by the Kindle software having become an app buried in the Users tree? Previously it was a stand alone program in the C:/Programs folder. OKAY – in case anyone picks this up I finally solved the problem. One needs a third party utility which will edit the list of associated file types. Then it is simply a case of adding the .mobi extension to the list. Windows will then pick up Kindle and as before a double click on a mobi file will a) open Kindle and b) add the book to the list in the Kindle library. You don’t need a third party app. You can do this all within Windows. Should work. You can set up the association between .mobi and Kindle in Control Panel (or Settings). I believe the Kindle app also has a File->Open option. I sometimes download books from Project Gutenberg onto my Kindle by accessing the site from the experimental browser on the Kindle and pressing “download” on the .mobi file. This puts the file on the Kindle itself but unfortunately it does not get synced to the cloud account and is not available on another device. Other than downloading it again on my computer and emailing it to my Kindle email, is there a way round this? Not that I’m aware of. Sorry. Thanks, Leo. This was a lot more helpful than Amazon’s instructions.